There's a big wedding on the way, and royal watchers couldn't be happier about it. The newly announced engagement of Britain's Prince Harry and American actress Meghan Markle has fans and followers on both sides of the Atlantic cheering. But there was a time a match similar to theirs received a very different reception — and it even reshaped the monarchy. In 1936, just months after his coronation, Britain's King Edward VIII gave up the crown because he fell in love with an American who, like Markle, had been married before. While Harry is fifth in line to the throne, Edward was just one spot away when he began seeing Wallis Simpson in the early 1930s. At the time, Simpson had already divorced a U.S naval officer but was still married to her second husband, businessman Ernest Simpson. Those were two complications that kept Edward's family — including his father, King George V — from embracing her. But when George died and Edward ascended to the throne in 1936, the relationship continued, and it all became much more complicated. Even though Simpson's marriage to her then-husband would be behind her by 1937, that offered no solution to their problems. Like British monarchs before and after him, Edward was also head of the Church of England and expected to uphold the teachings of the church; therefore marrying a divorced woman was out of the question. Besides, even if the church had allowed it, Edward's disapproving cabinet, ministers and subjects wouldn't have. So he had to choose between Simpson and Britain. In what was a shocking move, Edward chose her. He signed a document stating that he declared "irrevocable determination to renounce the Throne for myself and for my descendants." That's all it took to free him to marry Simpson the following year (then as the Duke of Windsor), and to free up the throne immediately. It's that last part that paved the way to the modern monarchy, because when Edward stepped down, his brother, George VI, stepped up. George remained king until his death in 1952, at which point his daughter — and Harry's grandmother — Elizabeth II took over. And lot has happened since then. "It’s extraordinary how far we’ve come since the 1930s," royal biographer Claudia Joseph recently told Reuters. "In less than a century times have changed beyond all recognition." The royal family under Queen Elizabeth has seen divorce and remarriage within its own ranks, leaving Harry's happy news completely scandal-free. 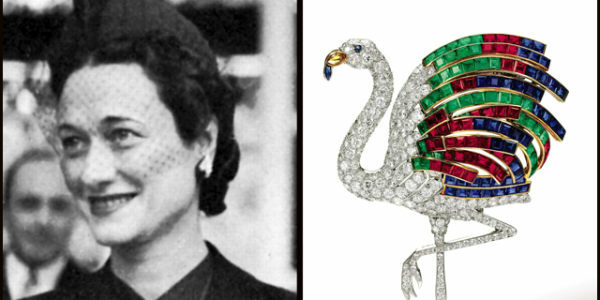 Fabulous jewelry formerly owned by Wallis Simpson, the Duchess of Windsor — the American for whom Edward VIII famously gave up the throne of England — was auctioned by Sotheby's.